Firstly, the point of any industrial action and the campaigning that goes with it is to get your employer to the negotiating table. 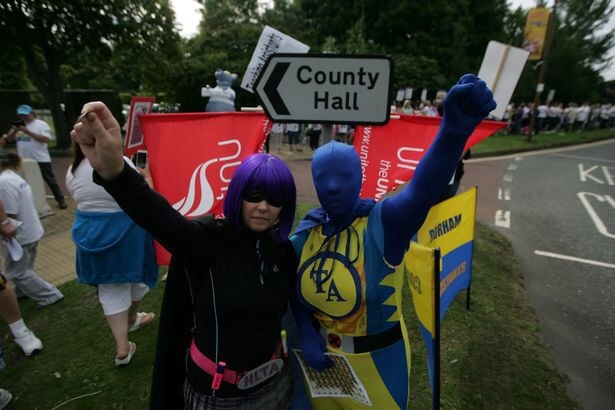 It’s almost unheard of for that action to bring a complete surrender, but Durham County Council, who said that they couldn’t regrade one group of staff, who said that they were bound by equality legislation and who said that they had made their last offer, were dragged kicking and screaming to the negotiating table this week, making significant concessions on dismissal notices and timescales along the way. There’s still vigilance needed, because Durham County Council have hardly shown themselves to be a trustworthy employer over the last year, especially in terms of this dispute. And, of course, they have attempted to couch it in legalistic language which makes their climbdown look less drastic, but compared to where we were just a couple of months ago, these are major steps forward, achieved almost entirely by the campaign run by a grassroots TA committee. Secondly, though, the focus on strike action is misunderstanding the significance of the Durham Teaching Assistants campaign – what is different about it and why it has achieved so much in such a short timescale, and with only four days industrial action so far. That’s because their real leverage was never about the actual withdrawal of labour. Ultimately, schools can deal with a certain amount of disruption, albeit damaging to the children’s welfare and education. But what is really significant about the Teaching Assistants isn’t the fact that they were prepared to strike, but that they built an enormous, visible and hugely engaging public campaign, which backed the council into a corner on a number of levels. That’s been about high profile and well organised public demos; it’s been about a constant online presence through social media; about people meeting together at the Miners’ Hall, Redhills and in cluster groups all over the county; it’s been about getting the message out to the country and getting solidarity back in spades; it’s been about getting the TAs story in the national and local media; it’s been about pressurising the councillors, publicly and internally via the Labour Party. Unlike many other union campaigns, the strikes are not the decisive factor. It’s the collective efforts of all the TAs in building this almighty, in-your-face, campaign which has made the difference: and that’s why, I believe, it has been such a success (where many other similar disputes have failed to get a result). None of that campaigning needs to stop, nor should it. And if people keep united and in touch with each other, keep organising together and maintain this incredible united front, the TA campaign will be ready to whip up a storm again, including strike action, when needed. That also includes putting pressure on Unison and their regional officials if needed. A big, underestimated factor in industrial disputes and wider campaigning is confidence. When people see the results of their actions, their confidence increases and they feel they can take on the world. Quite often, we forget to celebrate our wins, whether they are big or small ones. Forgetting to do that can lead to despondency or negativity, which is the opposite of what the #ValueUs campaign has been about. This is no substitute for bring realistic. We can’t go around calling defeats victories, but we do need to understand the big picture. To do that, we need to be confident and strong – about what we’ve achieved and what we can do again. That’s why, in my opinion, it was important to celebrate what the campaign had won in dragging DCC back to the negotiating table over the last week, all the time warning that this isn’t the end, only one battle in the war.